Nothing says I love you like a fresh out of the oven Chicago style pizza, and thankfully you can get our famous deep-dish pizza when you give this holiday. 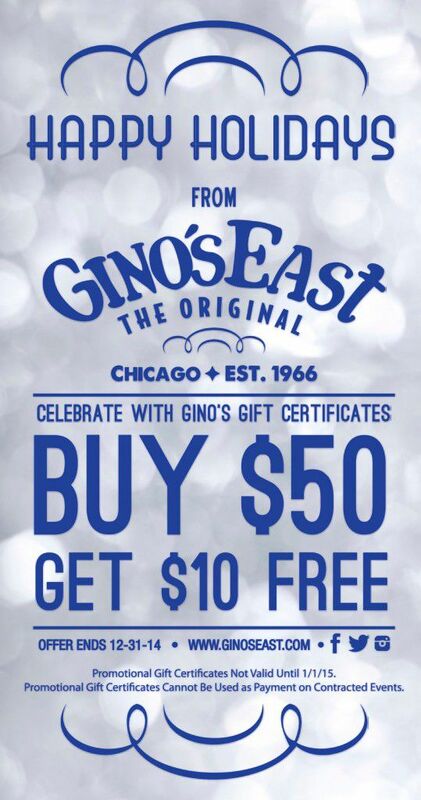 Gino’s is proud to offer you a free $10 gift certificate when you buy $50 of gift certificates for friends and family (or yourself). If your friends are craving a sausage deep dish to warm up this winter, if your family wants some zesty lasagna to bring in the New Year or if you want to invest that holiday bonus into something tasty; we got you. Happy holidays to everyone! What can you do with that extra gift certificate you ask? Sky’s the limit: give $25 to your two favorite nieces and the extra $10 to your not so favorite nephew. Consider stocking stuffers: ten bucks of happiness each. Why not give out some certificates at your holiday gift exchange and keep a few slices for yourself? This buy $50 get $10 free will be going until the end of December, so don’t waste any time checking off gifts on your holiday list!